Let's face it, making backups is no fun for anyone. Besides the initial tedium of deciding which files and folders to back up, there's also the annoyance involved with remembering to run the backups on a routine basis, something that most of us eventually slack off on doing, with disasterious consequences. That's why today's discount software promotion, BackUp Maker, is so useful - it automates the process of making backups, providing you with a greater level of protection! BackUp Maker lets you easily create backup tasks for files and folders based on time intervals or events. With BackUp Maker, you'll never have to ever worry about forgetting to run the backup job. Instead, you tell BackUp Maker what it needs to back up, and when, and the program goes to work, automatically following your instructions to the letter. Need a backup made every week? Month? Day? It's done. Want to execute backup jobs at Windows log-on or log-off? So easily done with BackUp Maker. 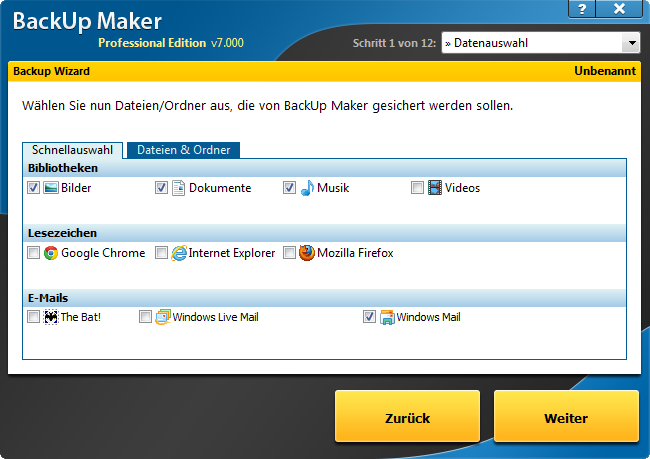 There's a great deal of flexibility with BackUp Maker. You could use partial backups to save space, or create multiple backup generations for extra security. There's support for writing backups to internal drives, external drives, USB devices, and even directly to CD and DVD. An integrated FTP client lets you upload your backup file to a secure webserver for the ultimate in off-site storage. After you purchase BackUp Maker it may be used indefinitely. 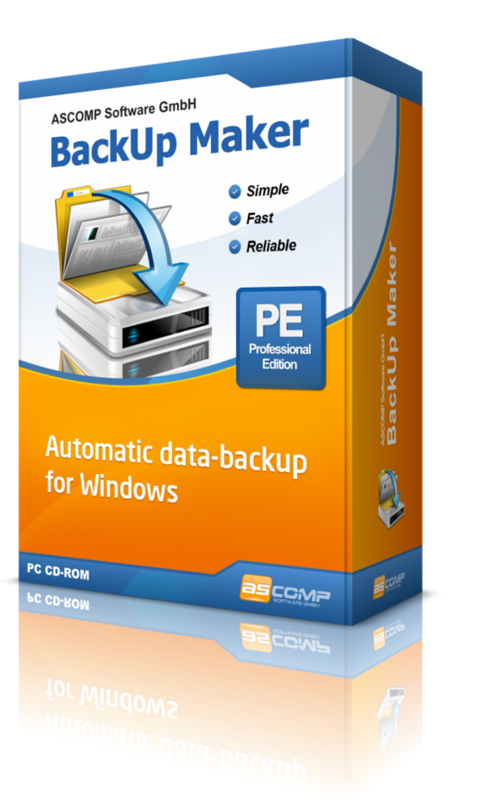 BackUp Maker is licensed per user, so if more people are going to use BackUp Maker you will need to purchase additional copies. 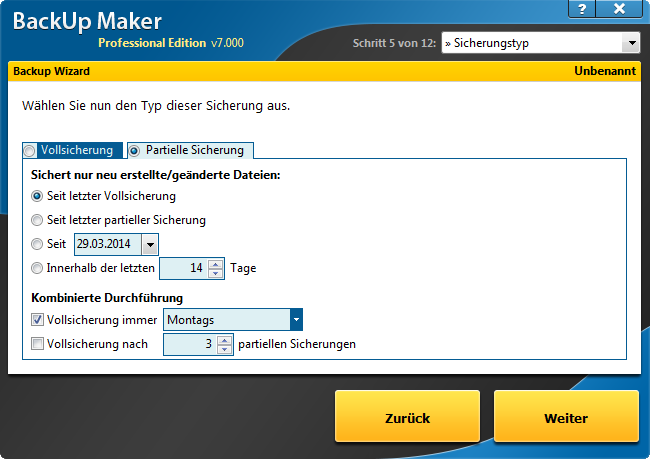 Each license allows installation on 2 computers, but BackUp Maker may not be used at exactly the same time on each of them. Upgrades to future versions of the software will be free for 24 months. For versions after that, upgrades will require additional payment, which will be discounted by 40%. Support is provided for 24 months after your purchase. 1. Does the program work in a network? 2. Can I select directories of computers from the network to back up to an external HD and / or FTP? 2. Is the version offered standard or professional? 1. Yes, it does. You can test the free Standard Edition prior to your purchase. 3. It's the Professional Edition. Is it possible to backup locked files via vss? No, VSS is not supported. Susan User I have used this program for years (Professional Edition), and love it! The backups are stored as a zip document, so you don't need any special program to open them. It's easy to set up a backup to an external drive, which only runs when the drive is plugged in to the laptop (I don't leave my external drives plugged in all the time). Stephen Warkentien Does the program support, full, incremental and differential backups? Is there an option to back up files individually, uncompressed instead of combining them into a zip file? 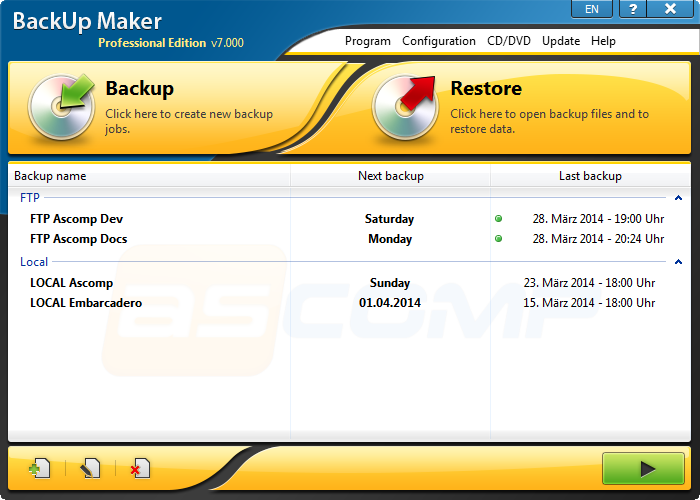 BackUp Maker support full, incremental and differential backups (called "partial backups"). For copying/synchronizing files, we offer Synchredible alternatively. SKY I wanted to buy this, and not being able to find any information about whom to pay, I went all the way to the page where I would have to fill in my credit card details.And still, there was or is no mention of the payment processing company's name, ID, etc. Does the software company run a payment processing company as well? Then where are it's credentials, VAT number, full address, etc.? I am NOT giving my card details to some guy behind a computer selling some simple enough software. I NEVER use PayPal, so please do not suggest those crooks either, but use and show reputable processors like cleverbridge or Avangate or whatever but as it is, this is a no-go for me. We offer PayPal and credit card payment. We have credit card acceptance agreements with AMEX, VISA and MasterCard, if you choose credit card payment option. Our legal company address can be found in Imprint as usual. Thank you for your reply, in effect repeating my complaint disguised as a reply. I told you already about PayPal, so about credit card payments; I am sure you have a legal address and that is disclosed somewhere on your web site, but you are NOT a payment processing company, right? If so, who else do you represent? Otherwise, this means I am giving my credit card details to you or to your accountant, whose identity I do not know and in case of fraud, I cannot hold you or him/her responsible, even I could prove it. If you were an online store selling hundreds or thousands of goods, your personal agreement with card companies could be acceptable but not as a sole programmer running a one man show, It does not instill much confidence, sorry. You must not be stingy and accept to pay some commissions to some reputable payment processing company as I've listed in my initial complaint. So, you lose one customer, and I am sure you do not care, so be it. Although I cannot follow your logic regarding the responsibility (why should it be easier to make a payment provider responsible than a software company? And how do you know the identity of a payment provider better than ours?)... Our payment provider is 1&1 Germany.